Tension Stiffening in reinforced concrete is the increase in stiffness of a cracked member due to the development of tensile stresses in the concrete between the cracks. The main application of tension stiffening theory in design applications is in the estimation of the bending deflection of transversely loaded beams and slabs, where this effect has a significant effect, especially at bending moments just above the cracking moment. Empirical adjustment methods, based on evaluation of an intermediate stiffness between the fully cracked and uncracked values, dependent on the ratio of the service moment to the cracking moment. “Smeared crack” methods where an effective tensile stress-strain relationship is developed, based on the average strain in the concrete, with the displacements at cracks distributed over the length between the cracks. The stress-strain relationship may be fully empirical, or based on rigorous analysis, or a combination of the two. Rigorous methods modelling the formation of cracks, the actual tensile stress-strain behaviour of the concrete before and after cracking, bond stresses and bond slip at the concrete-reinforcement interface, and, where applicable, the non-linear behaviour of the reinforcement and the concrete in compression. A recent issue of the Institution of Civil Engineers “Structures and Buildings” journal (1, 2) contains two papers examining tension stiffening effects in flexural members based on rigorous analysis, which has then been used to derive a new smeared crack model. Predicted beam deflection results using the new model have been compared with experimental results, results from rigorous analysis, and results using empirical methods contained in design codes, and found to be in good agreement. I have updated the RC Design Functions spreadsheet to include two versions of the new model. The spreadsheet, including full open source code, can be downloaded from RC Design Functions6.zip. 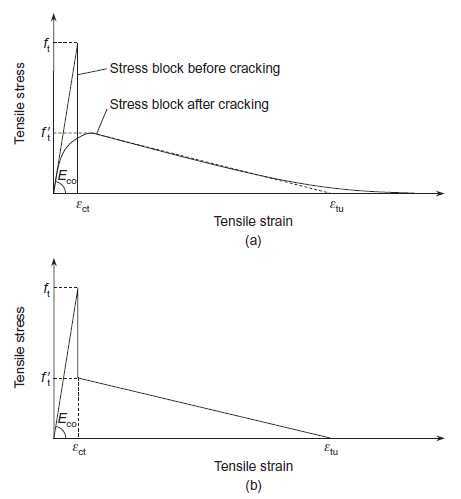 The concrete tension stress-strain model recommended by the paper is Figure (b) below. This is based on the combination of the relationships before and after cracking shown in Figure (a). The two models have been combined for simplicity on the grounds that the higher concrete tensile stresses allowed in the “pre-cracking” model will always occur near the section neutral axis, and hence will have little effect on bending moments. 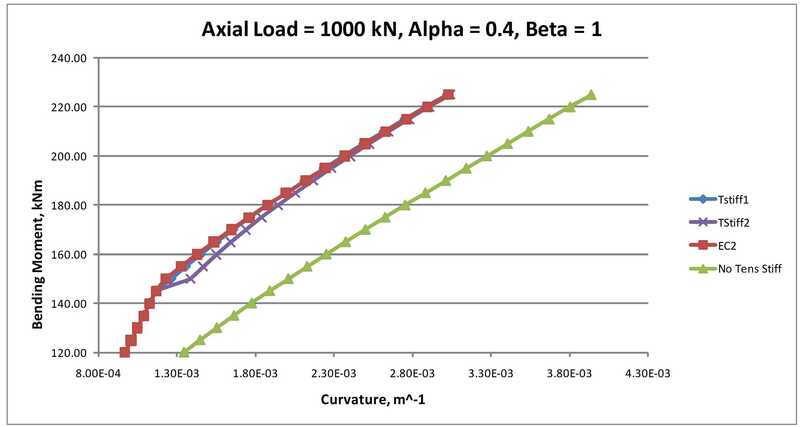 This is true for sections with small or zero axial load, but where compressive axial loads are larger the effects of the rising tensile stress zone become significant. Also since different analysis procedures are required for the cracked and uncracked sections there is little additional complexity in using a different stress strain curve for the cracked section. Check maximum tensile stress assuming an uncracked section. If this stress exceeds the cracking stress, or if the section is flagged as previously cracked, find the depth of the neutral axis and maximum concrete compressive strain ignoring concrete tensile stresses using a closed form solution. Using the results from step 2 find the axial force and bending moment due to the concrete tensile stresses. Algebraically subtract the force and moment due to concrete tensile stresses from the applied loads, and recalculate the depth of the neutral axis and concrete compressive strain ignoring concrete tensile stresses. Recalculate the axial force and bending moment due to the concrete tensile stresses. 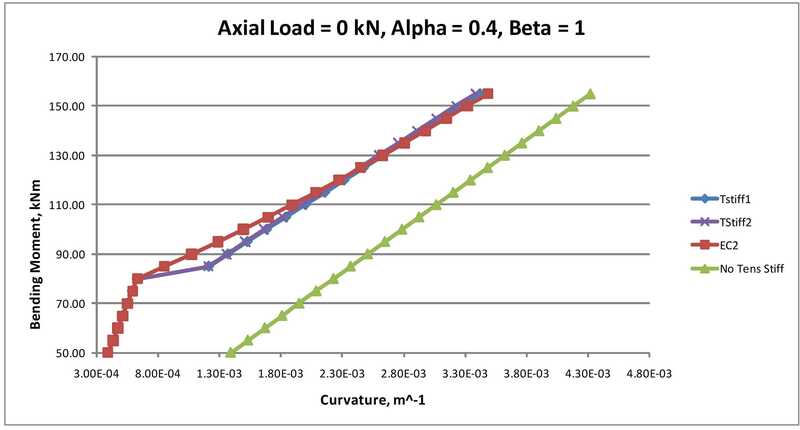 Find the difference between the applied axial force and bending moment and the sum of the revised applied loads and the reaction forces due to concrete tensile stresses. Repeat steps 4 to 6 until the load difference found at step 6 is less than a specified tolerance. The section curvature may now be calculated from the depth of the neutral axis and concrete compression strain found in the last iteration. TStiff1 indicates the results using the stepped bi-linear tension block shown in Figure (b). TStiff2 indicates the results using the parabolic linear tension block shown in Figure (a). Beta is the Eurocode 2 factor for loss of tension stiffening. Beta = 1 for short term loading and 0.5 for long term loading. 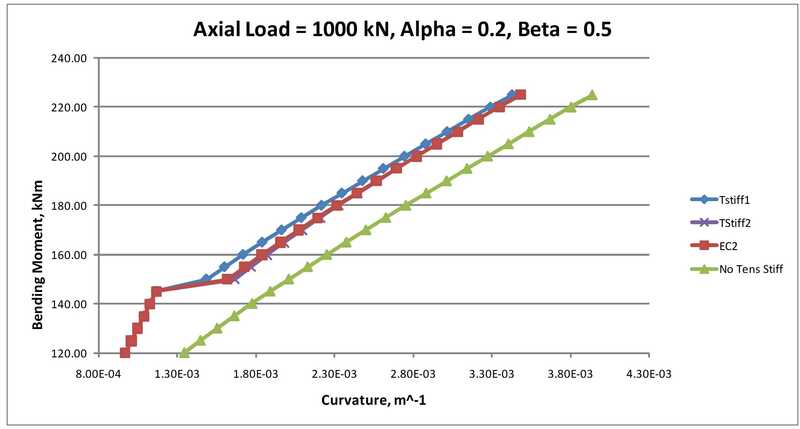 The results allowing for concrete tension are in reasonably good agreement with the Eurocode 2 results in all cases, but give slightly greater curvature at bending moments just above the cracking moment for sections with zero axial load. 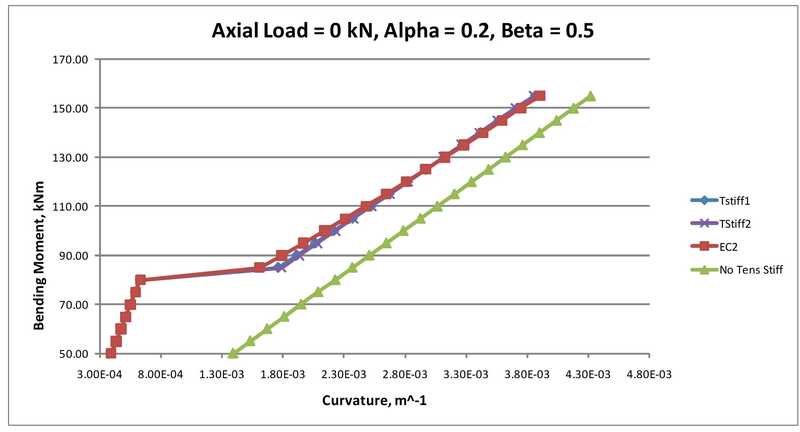 With 1000 kN axial load the parabolic-linear stress-strain curve (TStiff2) gave significantly greater curvature than the stepped bi-linear curve (TStiff1) at bending moments just above the cracking moment. For short term loading the TStiff1 results were in better agreement with the Eurocode 2 results. For long term loading the TStiff2 results were in better agreement with the Eurocode 2 results. In summary, any of the three analysis methods compared here are likely to provide satisfactory results. For practical design applications the Eurocode 2 method will be satisfactory, but for research purposes or for comparison with experimental results the tensile stress block method is better correlated with the actual bending mechanisms, and provides better and more rational means of adjustment for such factors as change in concrete tensile strength, creep and shrinkage strains, or changes in steel/concrete bond characteristics. If the tensile stress block method is employed the use of the parabolic-linear stress block is closer to the underlying analytical results, and requires little if any increase in complexity of the analysis process, and is therefore recommended. P.L. Ng et al., “Tension Stiffening in concrete beams. Part1 FE Analysis”, Structures and Buildings, Institution of Civil Engineers, Vol 163 Issue SB1, Feb 2010, pp 19-28. J.Y.K. Lam et al., “Tension Stiffening in concrete beams. Part 2 member Analysis”, Structures and Buildings, Institution of Civil Engineers, Vol 163 Issue SB1, Feb 2010, pp 29-39. This entry was posted in Beam Bending, Concrete, Excel, Newton, UDFs, VBA and tagged Excel, moment curvature, Reinforced Concrete, tension stiffening, UDF, VBA. Bookmark the permalink.